We all live in an unsafe world, so taking certain precautions to stay safe is not a bad idea. We cannot be always at home and protect it from burglars. But the technology that surrounds us can simplify our lives and help us to protect our home, family and belongings from a trespasser. 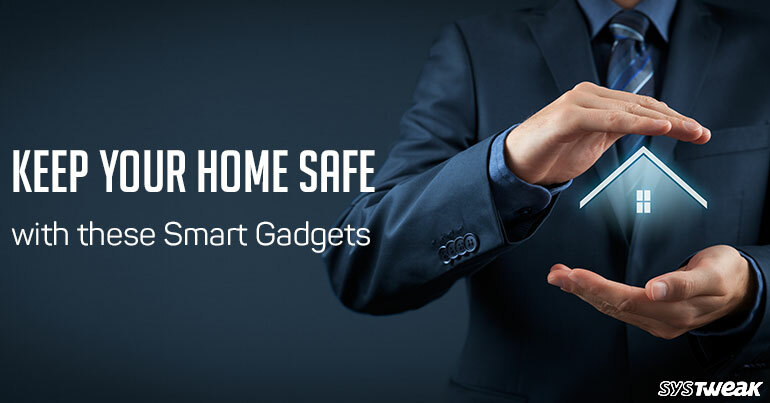 No gadget can give 100% assurance but can surely alert you, scare them off and interfere the bad guys from breaking into your place. Here we list down the best gadgets that will keep alert you about who’s coming and going. Plus, you can even make a video and view it later to see all the activities performed when you were not around. Now see who’s at your door with Skybell anywhere and anytime. It is a smart video doorbell that allows you to see, hear, and speak to the visitor at door using your smartphone. SkyBell Doorbell helps you live without worry, no more thinking about your home safety or missing important packages. With SkyBell you can see everyone at your door and the 1080p resolution gives a terrific video quality. It can be integrated with Alexa, Nest, and IFTTT and gives your free online video storage. The smartest way to secure your home from snoopers and keep an eye on front door, courtyard and everything else. Leave the home security stress with Canary. Just install the Canary system and use the app to get live alerts. It offers different modes making things easy for you. Away Mode send you notification when all are away. Home Mode when you are home Canary disarms itself based on the settings. Plus, it doesn’t disturb you when asleep also the privacy mode disables Canary’s camera and microphone. Not only this in an emergency you can sound the siren, call local police from the app with all the evidence. To know more and buy the product click here. Another security system designed to protect your home, with this you don’t have to compromise the style. It utilizes Wi-Fi signal to send information about who’s at your place when you are not around. You get notification even on your iOS lock screen and it records everything. Install the system in any style of light fixture either on your front door, backyard or wherever you want. To know more and buy click here. A unique way to unlock your door, just use the ekey on your smartphone to unlock the door. Get notifications about who locked, unlocked the door and use the eKey. You can give access to your loved ones when not around by sending them the eKey. You can revoke the access anytime you smell something is fishy when granting the access. Get alert message when someone gets in and out of the house and keep your home secured. These security systems will surely give you peace of mind when outside or on vacation. Even you can keep a check on your kids and know when they are back. Commonly burglars ring the bell to know if anyone is at home so using these devices you can make them feel that you are at home. But do remember this does not guarantee 100% security but surely add up to a layer of security. Adobe has announced in CES 2018 that its stepping into the home security. Lota offers an all-in-one camera that will work with Siri, Z-Wave and Zigbee, Google Assistant and Amazon’s Alexa.